We’d love your help. Let us know what’s wrong with this preview of Grant and Lee by J.F.C. Fuller. To ask other readers questions about Grant and Lee, please sign up. Iconoclastic as always, Fuller picks Grant over the historian's darling (and mine), Robert E. Lee as the better general. Strong argument, extensive research, and convincing logic. Don't read Fuller unless you're ready for someone to mess with your preconceptions. J.F.C. Fuller’s analysis and comparison of the generalship of Grant and Lee is remarkable for its conclusion: that Grant was the superior general. This conclusion would not be in the least bit controversial were it not for the cult of Lee-worshipers that emerged after the Civil War and have largely dominated the historiography ever since. Faulty analysis, lazy research, barely concealed bias, and outright fabrication have elevated Lee to sainthood and, until recent years, relegated Grant to the J.F.C. Fuller’s analysis and comparison of the generalship of Grant and Lee is remarkable for its conclusion: that Grant was the superior general. This conclusion would not be in the least bit controversial were it not for the cult of Lee-worshipers that emerged after the Civil War and have largely dominated the historiography ever since. Faulty analysis, lazy research, barely concealed bias, and outright fabrication have elevated Lee to sainthood and, until recent years, relegated Grant to the role of slow, plodding battlefield butcher who gained victory only through superior resources. Nothing could be farther from the truth, and Fuller illuminates this reality. However, even in arriving at the correct conclusion (many years before such historical reinterpretation had gained any semblance of general tolerance), Fuller still falls victim to the propaganda of the “Lost Cause.” In particular, he lionizes Thomas “Stonewall” Jackson to the point of hagiography and completely ignores Lee’s other excellent corps commander, James Longstreet. In this oversight, we see that the post-war Lee Cult continues their triumph of character assassination against Longstreet — after all, if Lee was a Christ-like figure, he must have a Judas. Read Jeffrey Wert’s excellent biography of James Longstreet to see the facts more clearly. It was Longstreet, not Jackson, that Lee elevated to 2nd in command of the Army of Northern Virginia. So, Fuller does not completely escape the clutches of the Lost Cause myth, even as he challenges that myth’s most cherished pillar. The author was a British general and he gives a non- partisan look at the generalship of Grant and Lee, the former underestimated and the latter perhaps overrated by most historians. The book game me some new insights on the Civil War from a career military man, especially concerning grand strategy, technology change, and political leadership. Worth the read. Personally I prefer reading historical fiction to dry textbook material, and although this book takes an analytical rather than anecdotal approach to the generalships of Grant & Lee, I was pleasantly surprised by how much I enjoyed reading this text. Of course, my delight in this material is most certainly affected by my interest in all things "civil war". The author, Maj Gen Fuller, took a very contrary view from that which was commonly held at the time of publication in 1932; namely that Le Personally I prefer reading historical fiction to dry textbook material, and although this book takes an analytical rather than anecdotal approach to the generalships of Grant & Lee, I was pleasantly surprised by how much I enjoyed reading this text. Of course, my delight in this material is most certainly affected by my interest in all things "civil war". The author, Maj Gen Fuller, took a very contrary view from that which was commonly held at the time of publication in 1932; namely that Lee was a brilliant commander who lost because of negative external influences and Grant was a mediocre commander who won because of overwhelming numbers and equipment. Basically, Fuller attempted to show that Grant was more competent than he was credited for and Lee was more inept than most would concede. Many eyewitness accounts were drawn upon to show that Lee was a brilliant tactician in many respects but he lacked the personality, authority and grit of a commander-in-chief who grasped the grand strategy needed to win a defensive war for the Southern States. Fuller argues that Grant however, learned from some of his early mistakes in battle and eventually became the grand tactician who knew how to win the offensive war that the North began in 1861. I just can't get enough of everyones favorite british nazi. This book reinforces the points made in his biography of Grant's generalship, but more directly attacks Lee's at the same time. It's excellent to have your pre-conceved notions of each general challenged, but I can't help but feel that Fuller's analysis is hurt by his steadfast determination to put Grant above Lee as a general. Not that I disagree with him, his analysis is harsh but fair to Lee, it's just that it's typically only fair, I just can't get enough of everyones favorite british nazi. 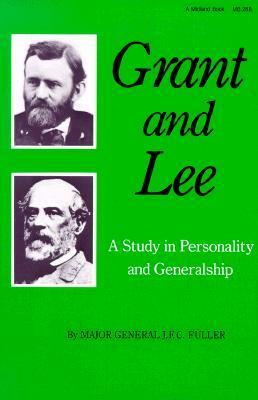 This book reinforces the points made in his biography of Grant's generalship, but more directly attacks Lee's at the same time. It's excellent to have your pre-conceved notions of each general challenged, but I can't help but feel that Fuller's analysis is hurt by his steadfast determination to put Grant above Lee as a general. Not that I disagree with him, his analysis is harsh but fair to Lee, it's just that it's typically only fair, and not harsh to Grant. I would suggest reading this or "The Generalship of U.S. Grant" along with "The Wilderness Campaign" by Clifford Dowdey, which is a book with the complete opposite view of Fuller. Dowdey is certainly more on the ridiculous side than I think Fuller would ever go, but if both are read the reader may be able to find a happy middle ground in which to analyze things a little more objectively. Tad archaic (1957 copywright) grammar, but easy to get into once you get past the first pages and settle down into the swing of Maj. Gen Fuller's story telling cadence. The short of it; Lee's results arguably don't deserve the legend they have become over time, Grant's pre and post war biography - for good or for bad - usually overshadow the results he achieved as a General. My take; the South had the success it did arguably in large part because of the type of leader Lee was. Conversely, the So Tad archaic (1957 copywright) grammar, but easy to get into once you get past the first pages and settle down into the swing of Maj. Gen Fuller's story telling cadence. My take; the South had the success it did arguably in large part because of the type of leader Lee was. Conversely, the South did not achieve independence in large part because of the type of leader Lee was. Had Lee paid more attention to Washington's tactics in the Revolution, had Lee and Davis been more on the same page, had Lee been more forceful with Davis and been a better administrator, well who knows. For the North, Grant was the right man at the right time. As Lee was beginning to stumble, Grant was getting into his stride. The contrasts and comparisons of the two men and their approaches to their jobs as made by the author are enumerated and interesting. Being a military man, his discussion and explanation of tactics and strategy in regard to manpower, battle plans, command and control and weaponry bring a technical certitude to the conclusions drawn. Worth a read - unless you are a devout Lee follower drawn into the simplistic argument that the North would have won anyway because they had more resources. Pretty interesting book. Flips on your head what you think about Lee and Grant. Though it gets into some specific details, it has a lot to cover in about 175 pages, so it feels like more could've been included. An amazing writer though. Very dry and outdated by the standards of today's scholarship. A good study of contrasts of these two supreme generals. It has spurred me to want to read more about both men . If you are a Civil War buff , then you may want to read this book. Major-General John Frederick Charles Fuller, CB, CBE, DSO was a British Army officer (1899–1933), military historian and strategist, notable as an early theorist of modern armoured warfare, including categorising principles of warfare. Fuller was also an early disciple of English poet and magician Aleister Crowley and was very familiar with his, and other forms of, magick and mysticism.